I am going to put it out there – you really need to make these Carrot Cake Muffins as soon as you can. So go and pre-heat your ovens now. They are SOO good. And better yet, there is no added sugar in these delicious muffins. Yup, completely free from added sugar! 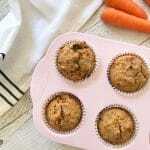 These Carrot Cake Muffins are sweetened only with the natural goodness of fruit. Plus they have a generous serve of vegetables. 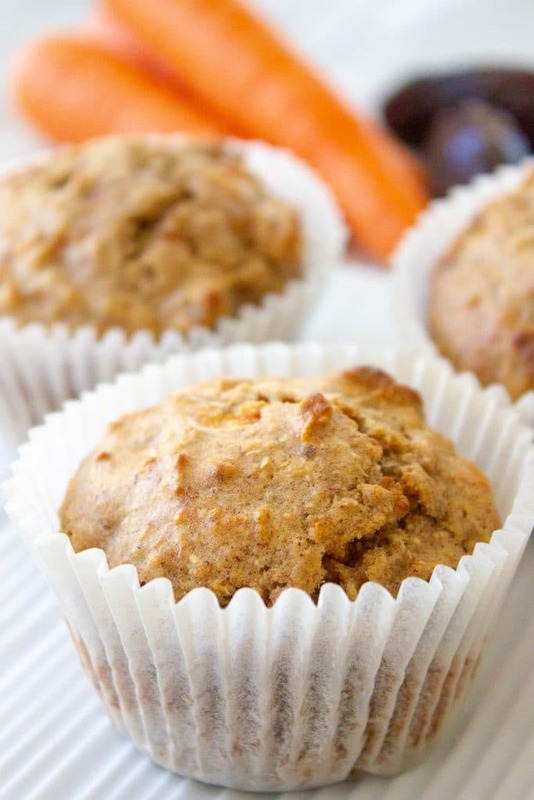 So this makes these Carrot Cake Muffins just the perfect muffin for school lunches. When I first made these I used grated apple as another sweetener, and while the muffins were nice, they really just didn’t have the depth of flavour that a carrot cake does. So I went back to the drawing board (or should I say the kitchen?) and decided to try sweetening with dates due to their caramel-like flavour. And it’s the dates that really add something special to this recipe. 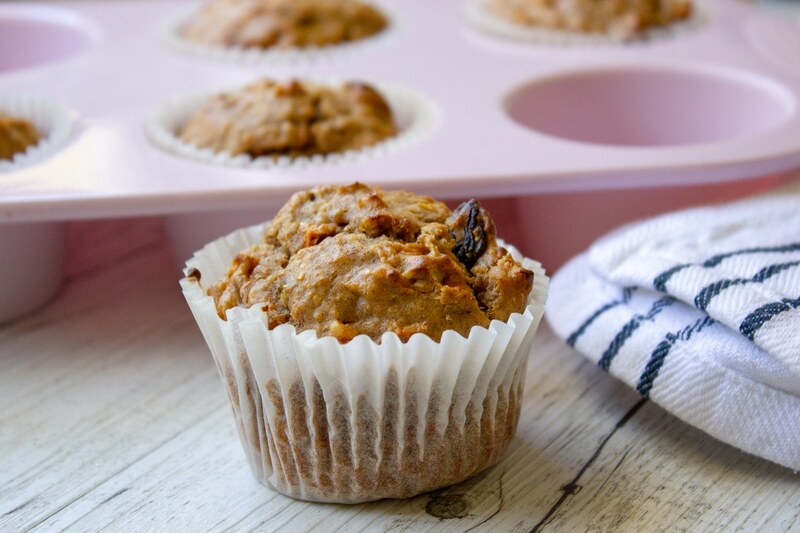 The smell of these Carrot Cake Muffins baking is out of this world. So sweet and spiced and quite simply mouth-watering. I have to say one of my favourite smells (next to freshly cut grass and the smell of rain on hot pavements) is the scent of baking. I have the most vivid memories of the most delicious fragrance of baking coming from my Nana’s kitchen. She remains one of the best bakers I know, and I like to think maybe I inherited a bit of her magic. Do you like carrots? Why not try these delicious Wholemeal Carrot Muffins, or these Carrot Cheddar and Poppy Seed Crackers? 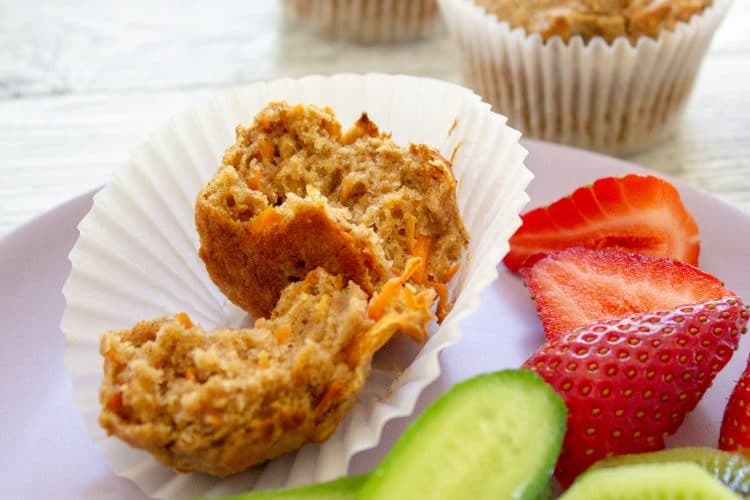 These delicious Carrot Cake Muffins are fantastic for school lunches. Sweetened only with fruit and containing a generous serve of vegetables these are a fantastic snack for kids and adults alike. In a small food processor blitz the medjool dates and vanilla extract to form a paste. If the dates are a little dry and do not break down add a small amount of water. This recipe is forming part of a no added sugar baking series of recipes I am working on, where the recipes are only sweetened with fruit, based on the amazing success of my Apple Oat Cookies. 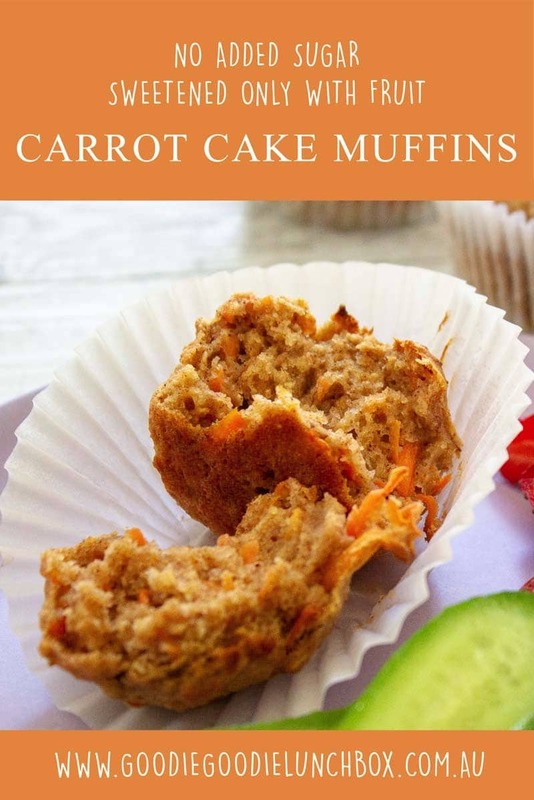 So I hope you and your family enjoy these delicious Carrot Cake Muffins and I would love to hear what you think and if this is something you would like me to work on. PS you can always catch me hanging over on instagram and facebook so come say hi! And remember to sign up for my mailing list so you can be the first to be notified of new recipes and get these delivered right to your inboxes! I love any recipe that only takes 25 minutes. I’ll have to check out the Apple Oat Cookies too. Hi There. I am just trying t make these muffins but there is no egg in the ingredients list. How many do we put in because it has egg in the method? Thanks! Is wholemeal flour same as whole wheat flour? and they finished the fridge and started eating the FROZEN ones! That’s how good they were. Thanks B. You are awesome and deserve all the credit. Hi, would I be able to use maple syrup instead of the dates? If so, how much would you recommend? Thank you!